CAD Forum - How to install AutoCAD 2013 or Inventor 2013 in Windows 8? Neither AutoCAD 2013 and 2012, nor Inventor 2013 are officially supported in the operating system Microsoft Windows 8. If you need to run these applications under Windows 8, you can use the following unofficial installation and launch procedure. Always use the latest updates (service packs). Make sure your graphics card (driver version) and printer/plotter are supported by your CAD application. You don't need to use this special method for versions Autodesk 2014 and higher. The described approach summarizes our own compatibility tests of Windows 8 Pro 64-bit (performed in a VMware virtual environment). In Win8 go to the "Windows Features" settings - e.g. using search - and check the option ".NET Framework 3.5" (on top). If it was not yet checked, Windows will install this component. 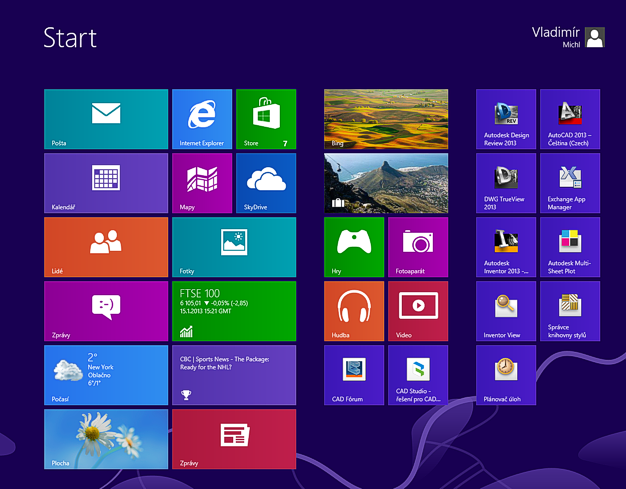 Customize the shortcut tiles on the Windows 8 startup screen (Metro, resp. Modern UI) to run your CAD applications conveniently. Tip 11665: Export to Excel creates an empty table with the text DeleteMe. Tip 10918: How to avoid (disable) automatic restart after Windows Update? Tip 10827: Originally maximized AutoCAD is restored from Windows taskbar as a window. Tip 10414: FATAL ERROR when starting AutoCAD 2016 - Access Violation Reading 0x0018. Selected tip: Faster 3D display in Revit.